Here's one for the eco-junkies: Full Circle, a company that creates environmentally-friendly products that clean your home without screwing with Mother Earth. Their sponges, brushes and towels are all biodegradable and made from renewable resources like bamboo. The two-sided Flip Loofah Sponge, for example, is made from cellulose (a plant-based fiber) on one side, natural loofah on the other and completely decomposes. Although I wish it were slightly smaller for my tiny hands to handle, I have to say it's so durable that it won't fall apart no matter how hard you scrub that pot. And the less sponges you go through, the better it is for your pocket and the environment. This week, four of you will win two Flip Loofah Sponges. Just leave a comment below about how you're trying to live a greener life and the winners will be randomly chosen Thursday night! CONGRATULATIONS: Sugarlens, April, Anonymous and Kathy Sykes are this week's winners! We use cloth diapers, cloth napkins and try to recycle everything that is recyclable. Okay, just reading Jessica and Allyson, I don't think I should be considered for this giveaway. LOL Cloth diapers? Umm, no thanks. I think it's GREAT when others do though. And everything Allyson rattled off is WAY beyond my comprehension. We tried recycling in the house, but we realized we have zero room to put the recycling bags. They just got in the way. So I took that service off our trash list and consolidated to one bag that we throw everything in and then sort it at the recycling bins four miles away. We don't litter though. Does that count? I was wondering where the Give- Away was. I live greener by ....ummm by using my own mug to drink tea and hot chocolate in the mornings instead of a paper cup. Also, I recycle my newspaper! Now can I Have my sponge. Those look really cool! About a year ago, I quit using disposable plates and cups and cut back on paper towell use by using a cloth distowell. I also started carpooling to meetings to save on fuel! we try to be eco conscious as well. 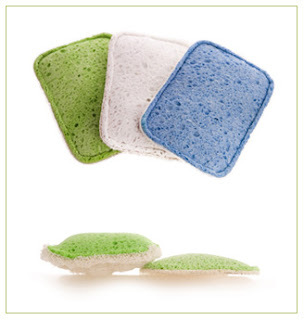 Would love to try these, I haven't had much luck finding eco friendly sponges yet. I'm not one of those that believes climate change is caused by people, I do believe very strongly that we need to take care of the planet. I try to reuse everything I can. I'll reuse Ziploc bags if they didn't have meat or anything in them. I'll use newspaper for gift wrap, etc. And I have made the switch to using my own cloth grocery bags. The 3 Rs- reduce, reuse, and recycle! We recycle EVERYTHING, I shop a lot at consignment sales for things for my daughter, and also reduce the amount of packaging we use. So simple, but I'm really committed to doing that part right and adding in other eco-friendly ideas as we go. I am very good at turning off TV when I am not watching, putting the laptop on standby when I am away, and trying to repurpose everything. Our family is recycling more and eating more local produce! hmmm, great question...how am I trying to be greener?? Well I recycle almost everything and am making my way to use more organic foods and products. Trying to recycle on a regular basis. I would like to try those.